"I'm with You" is a song by Canadian singer-songwriter Avril Lavigne for her debut album, Let Go. It was released on November 19, 2002 by Arista Records as the album's third single. The song was Lavigne's first ballad released as a single. It was the second Lavigne song to be nominated for a Grammy in the categories Song of the Year and Best Female Pop Vocal Performance at the 2004 Grammy Awards. The song reached number four on the US Billboard Hot 100, as well as reaching the top ten in nine other countries, thus making it Lavigne's third single to reach the top ten. "I'm with You" received radio and television airplay in Australia, but it was not officially released there. The song received critical acclaim from music critics. The arrangement of singles from Let Go, with "I'm with You" as the third, was regarded as "controversial choices", given that "I'm with You" was "thought by some to be the biggest potential smash on the album", and could have established Lavigne as a more mature artist if it was released first. According to Reid, "Some people just really didn't get that. And with the first video, there was some concern that maybe because it's so young and so playful, it might alienate more serious music lovers." KidsWorld called it "the perfect song to drown your sorrows to when that guy from your class breaks your heart." 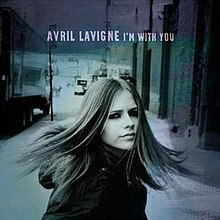 "I'm with You" became Lavigne's third top 10 song when it peaked at number four on Billboard Hot 100 in 2003 during its ninth week on the chart. The song spent ten consecutive weeks on the top 10 and twenty-seven weeks on the Hot 100 making it Lavigne's second-longest staying song on this chart, surpassed by her debut single "Complicated" which stayed on the chart for 31 weeks. "I'm with You" ranked at number 18 on the Billboard Year-End Hot 100 singles of 2003 and number 13 on the Canadian Singles Chart. The song was certified gold by Recording Industry Association of America in 2006 for sales of over 500,000 copies in the United States. As of July 2013, I'm with You had sold 556,000 digital copies in the US. As a double A-side DVD single, the "I'm with You"/"Sk8er Boi" video single was certified gold and platinum in 2003. In United Kingdom, "I'm with You" was released on March 31, 2003. The song debuted and peaked at number seven on the UK Singles Chart in 2003, becoming her third top ten single on the chart; the song re-entered in UK Singles Chart in the week of 17 December 2011 in number 58. It debuted at number six and peaked at number five in Ireland, staying in the top ten for six weeks. "I'm with You" reached top five in New Zealand; top ten in Belgium and the Netherlands; top twenty in Sweden, Switzerland, Austria, Germany, Norway and Denmark as well as reaching the top forty in France. The song re-entered the UK Singles Chart on December 10, 2011 at number 58, almost 10 years after the song first charted. Lavigne in a pub in the song's music video. The single's music video, directed by renowned photographer David LaChapelle, involves Lavigne, who is seen alone, trying to find someone, whilst her band members play the song alone in the streets. Showing her originally at a party, the video also sees Lavigne pushing a guy when he tries to get with her straight after making out with another woman. Most of the video is shown in slow motion but Lavigne's mouth movements are in sync with the song's vocals. This was achieved by recording the footage while the song was played twice as fast. The video also sees Lavigne walking on the streets and wearing a black jacket. Through the video, she is seen standing behind a snowy bank. At the end of the video, Lavigne walks out of the club with her coat on, kicks out the door and walks away. Much Music named the video one of the "Top 100 Best Videos of All Time". The music video was originally meant to end with Lavigne walking out of the club to her band mates, who then greet her and walk off together into the distance, but this ending was removed during post-production, ending the video with her leaving alone. An alternative version of the video leaked online to the internet, comprising alternate shots, slightly longer sequences and featuring the originally filmed ending. It was at least partly filmed in Los Angeles. The street shots were filmed on Broadway, and the Orpheum Theatre is seen. "I'm with You" was later featured in the season 3 Scrubs episode "My Tormented Mentor", in the Smallville episode "Accelerate" and in the movie Bruce Almighty. The song was also used in the 2003 Brazilian soap opera Mulheres Apaixonadas. Furthermore, it was featured in the video game Karaoke Revolution Volume 2 and in Singstar Rock Ballads. The song is also used as the background music for the Panasonic Lumix DMC-G85/G80 commercial, with Jennifer Garner and Cate Blanchett. Rihanna sampled the song on her track "Cheers (Drink to That)", which was released as a single. Lavigne made an appearance in the music video. Polish-Czech singer Ewa Farna covered the song and it was featured as a track on her album Měls mě vůbec rád. Sophie Evans covered the song in Week 3 of Over the Rainbow. A year later, Amelia Lily covered the song in Week 9 of series 8 of The X Factor. "I'm with You" was nominated for the 2004 Grammy Award for Song of the Year, and for Best Female Pop Vocal Performance but lost to Luther Vandross's "Dance with My Father" and Christina Aguilera's "Beautiful" respectively. (*) Note: The Platinum-award in the US are for the songs "I'm With You" and "Sk8er Boi" combined in a video single format. ^ Caramanica, Jon (December 4, 2013). "A By-The-Numbers Rebel". The New York Times. Retrieved 18 December 2013. ^ Willman, Chris (2002-11-05). "'Boi,' Oh Boy". Entertainment Weekly. Retrieved 2009-03-16. ^ "'Let Go' review". Entertainment Weekly. Retrieved 2009-03-17. ^ a b "RIAA Gold & Platinum Data". ^ "Sales updates on Avril Lavigne". Billboard. 5 July 2013. Retrieved 9 July 2013. ^ Music | 100 Best Videos Ever Archived 2009-12-24 at the Wayback Machine. MuchMusic.com. Retrieved on 2010-11-13. ^ "Avril Lavigne - Making of I'm With You (B Roll) 8/11/2002". ^ Copsey, Robert (30 September 2010). "Rihanna 'samples Avril Lavigne on LP'". Digital Spy. Retrieved 7 November 2010. ^ Sciarretto, Amy (21 October 2010). "Rihanna Samples Avril Lavigne on "Loud"". Artistdirect. Retrieved 7 November 2010. ^ "Austriancharts.at – Avril Lavigne – I'm with You" (in German). Ö3 Austria Top 40. Retrieved January 29, 2011. ^ "Ultratop.be – Avril Lavigne – I'm with You" (in Dutch). Ultratop 50. Retrieved January 29, 2011. ^ "Ultratop.be – Avril Lavigne – I'm with You" (in French). Ultratop 50. Retrieved January 29, 2011. ^ "Let Go - Avril Lavigne - Awards". AllMusic. Retrieved July 16, 2014. ^ "Danishcharts.com – Avril Lavigne – I'm with You". Tracklisten. Retrieved January 29, 2011. ^ "Avril Lavigne – Chart history" European Hot 100 for Avril Lavigne. Retrieved January 29, 2011. ^ "Lescharts.com – Avril Lavigne – I'm with You" (in French). Les classement single. Retrieved January 29, 2011. ^ "Offiziellecharts.de – Avril Lavigne – I'm with You". GfK Entertainment Charts. Retrieved October 29, 2018. ^ "Chart Track: Week 18, 2003". Irish Singles Chart. Retrieved January 29, 2011. ^ "Italiancharts.com – Avril Lavigne – I'm with You". Top Digital Download. Retrieved January 29, 2011. ^ "Nederlandse Top 40 – week 12, 2003" (in Dutch). Dutch Top 40 Retrieved January 29, 2011. ^ "Charts.nz – Avril Lavigne – I'm with You". Top 40 Singles. Retrieved January 29, 2011. ^ "Norwegiancharts.com – Avril Lavigne – I'm with You". VG-lista. Retrieved January 29, 2011. ^ "Arhiva romanian top 100 – Editia 24, saptamina 23.06-29.06, 2003". Romanian Top 100. Archived from the original on 2005-05-14. Retrieved 2018-10-05. ^ "Swedishcharts.com – Avril Lavigne – I'm with You". Singles Top 100. Retrieved January 29, 2011. ^ "Swisscharts.com – Avril Lavigne – I'm with You". Swiss Singles Chart. Retrieved January 29, 2011. ^ "Official Singles Chart Top 100". Official Charts Company. Retrieved January 29, 2011. ^ "Avril Lavigne Chart History (Hot 100)". Billboard. Retrieved January 29, 2011. ^ "Avril Lavigne Chart History (Adult Contemporary)". Billboard. Retrieved April 25, 2017. ^ "Avril Lavigne Chart History (Adult Pop Songs)". Billboard. Retrieved April 25, 2017. ^ "Avril Lavigne Chart History (Pop Songs)". Billboard. Retrieved April 25, 2017. ^ Recording Industry Association of New Zealand (2003). "New Zealand Annual Chart". rianz.org.nz. Archived from the original on 2010-07-22. Retrieved 2011-01-14. ^ "20 obras mais executadas nas rádios 2003" (PDF). abpd.org.br. Archived from the original (PDF) on October 7, 2010. Retrieved 3 February 2016. ^ "Swiss Year-End Charts 2003". Swiss Singles Chart. Archived from the original on 2013-12-27. Retrieved 2011-01-14. ^ "2003 UK Official Singles Chart" (PDF). Charts Plus. Retrieved 2011-01-14. ^ Myers, Justin (September 19, 2018). "Avril Lavigne official top 10 biggest songs of all time". Official Charts Company. Retrieved September 19, 2018. ^ "British single certifications – Avril Lavigne – I'm With You". British Phonographic Industry. Select singles in the Format field. Select Silver in the Certification field. Type I'm With You in the "Search BPI Awards" field and then press Enter. ^ "American single certifications – Avril Lavigne – I'm With You". Recording Industry Association of America. If necessary, click Advanced, then click Format, then select Single, then click SEARCH. ^ "American video certifications – Avril Lavigne – I'm With You". Recording Industry Association of America. If necessary, click Advanced, then click Format, then select Video Longform, then click SEARCH. This page was last edited on 12 April 2019, at 11:54 (UTC).